For this review, I've decided to pick something at random from the pile and that something is Goes To Purgatory, the debut album from Chicago sludge/metal band Jar'd Loose. Goes To Purgatory was released on July 10th 2012, via Cassette Deck Media. Jar'd Loose have been making a name for themselves in the US by playing alongside some pretty awesome bands, including The Atlas Moth and Tombs. My first impression of Jar'd Loose's sound is a little odd, as I've not heard vocal screams that high for a while. I guess I was expecting low growls, but different is good! Last Living Roach is a hard-hitting intro to these Chicago town beasts. They've got the chops and while the music is heavy, it's very listenable to and reminds me more of grunge to a certain extent. The thing you'll find with Jar'd Loose is that the vocals seem to overpower the music a lot of the time, and in doing so, a lot of the subtleties are missed. The instrumentation during the mid-section of Rotten Tooth is certainly worth racking up the volume for. The chuggy riffs at the start of Appendage bring to mind Black Sabbath and even Swedish band Grand Magus, but those are just my lazy comparisons and you should definitely listen to Jar'd Loose on their own merits. There's plenty of different textures within Goes To Purgatory too and while Jar'd Loose tend to stick close to the stoner/sludge sound, they throw in off-kilter guitar and some nice instrumental passages, like in Busted. The song lengths vary depending on how much they want to rock out and the production pushes the music out at a decent volume. Busted gets decidedly heavier as it winds it's way through its five minute playing time and it's easy to get lost in the song. Hell's Mothers marks the halfway point in Goes To Purgatory and it's a pretty apt way of describing Jar'd Loose. They certainly display plenty of devilish swagger during the song. Right Eye kind of comes across as a heavier Rage Against The Machine, certainly in the vocal department anyway. Penultimate song Go Down With You has a brooding intro and a menacing theme to it. 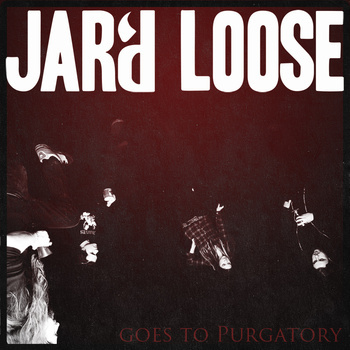 The quieter instrumental parts, containing quiet spoken-word vocals bring show a more evil side to Jar'd Loose. The underlying melody in Coming Like A Nightmare is a really nice way to close the album. It shows the band in an assured light and helps the record end on a high. The vocals may not be to everyone's tastes here but the album is well played, produced and would certainly get you kicking in a live setting! You can pick up digital copies of the album on their Bandcamp page above. You can pick up physical copies and other merch from their online store http://www.shopbenchmark.com/jardloose/. They're on Facebook at http://www.facebook.com/jardloose.